QaLL terminates running applications. And also can relaunch every apps which are terminated by QaLL with 1 button. Of course you can specify apps you don't want to terminate. Mac OS X is able to run many apps in parallel, but sometimes, especially when you play game or run big application, processing speed can be slow down because of other apps. So you should use QaLL to clean up needless process and feel comfortable to run big app. After you quit big app, you can launch every apps by 1 button and go back to your work. If you launch normally, QaLL terminates every applications and show "Launch!" button. Press "Launch!" button and QaLL relaunch every applications which were terminated by QaLL. 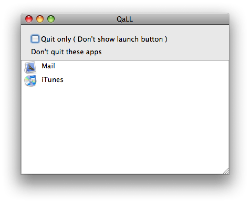 Put apps which you don't want to quit on the "Don't quit these apps" list through drag and drop. To remove app, select item and hit delete key. If you don't use "Launch!" button, please check "Don't show launch" button. QaLL terminates every app including itself. QaLL is freeware. There is no limitation to use this software. Please note that the author takes no responsibility for any damage caused by the use of this software. 06.04.02 2.0.1 Supported Intel Mac.